It’s cold outside, so PAT PILCHER settles in for some quality TV viewing time with LG’s latest OLED offering. A few years back I was lucky enough to see inside of LG’s OLED panel plant. It was a massive, clean environment that spanned several acres with just a handful of people working in it to keep an eye on its mostly automated manufacturing process. 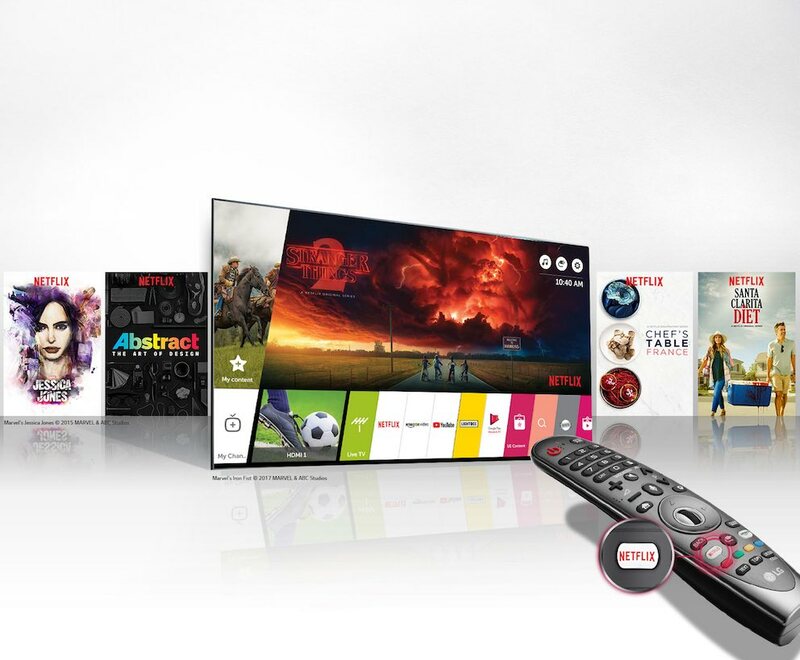 But having spent the best part of a fortnight with their latest OLED offering, the OLED55C8, the answer to this is literally crystal clear – make what was already a good range of TVs even better. As easy as that sounds, it’s still a tall order. Last year’s OLED TVs from LG also offered stunning on-screen imagery and nearly every feature a couch spud could possibly ever want. 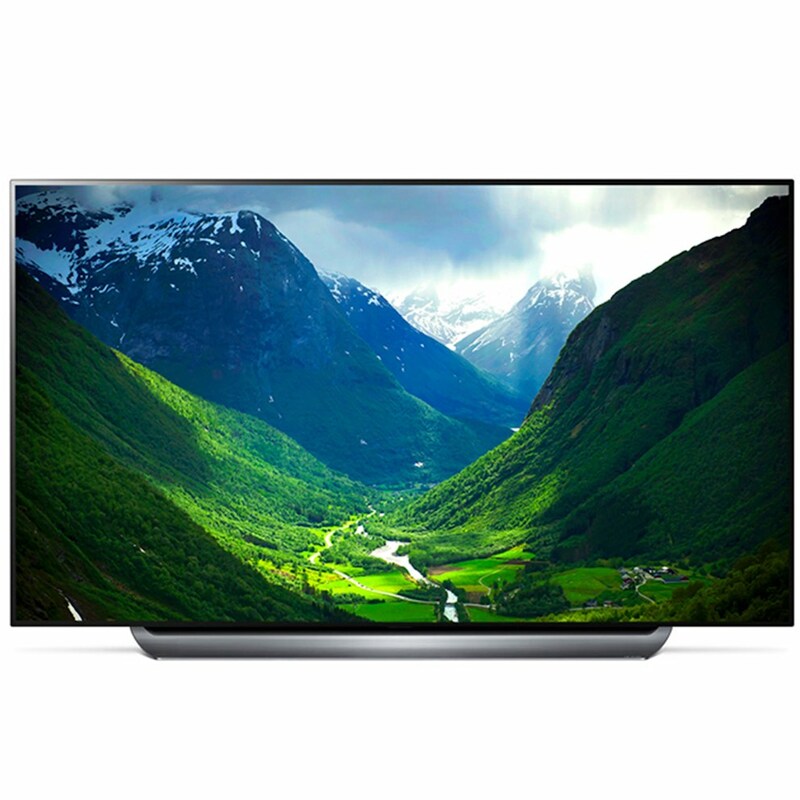 With the OLED55C8 you get a vast array of features as well as support for every form of high dynamic range colour rendering known to humanity. On the audio front, LG baked in Dolby Atmos sound. In short, LG may have pulled it off with the C8. This year’s model has also had some minor design tweaks and some nifty internal components. 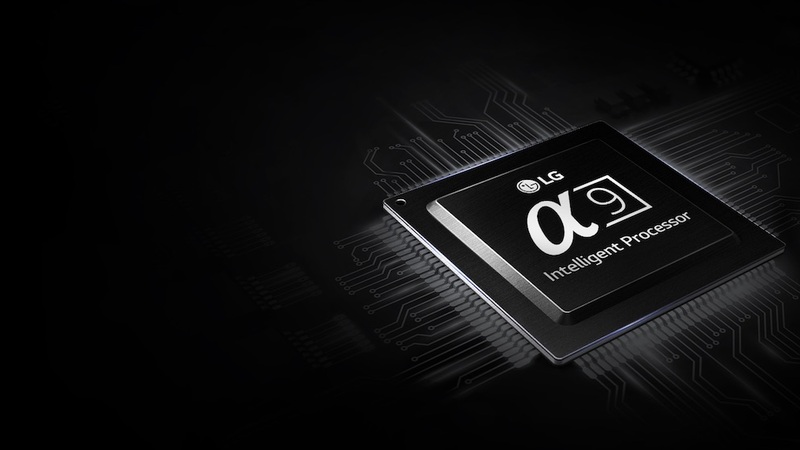 These include LG’s new Alpha 9 video processor which adds some refinements to what is already impressive on-screen goodness. It helps raise the already high OLED bar to stratospheric heights. LG’s OLED TV range comes in several sizes. I tested the smallest model (the 55″ OLED55C8). It still felt huge compared to my ageing 40″ LCD TV. The 65″ OLED65C8 is sizeable, but the 77″ OLED77C8 is a real whopper. Looks-wise the C8 sports the same ultra-thin design of previous LG OLED TVs. 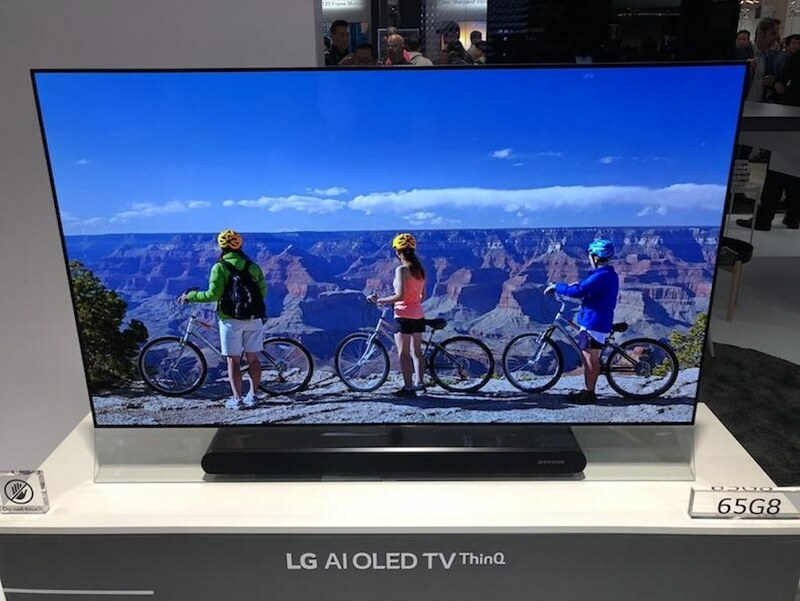 Where LCD TVs typically sport a chunky bezel and screen (backlighting takes a ton of space), OLED doesn’t need backlighting as it emits its own light. LG opted for an almost invisible metallic trim around the screen’s outer edge. In use it disappears, giving the viewer a chance to focus on what really matters – the screen. At its bottom is a base about as thick as the screen on my old LCD TV. 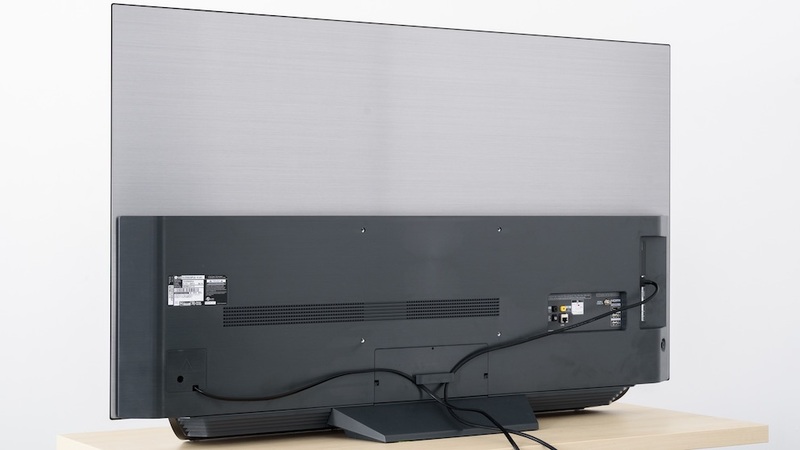 This houses the video processing hardware, speakers and HDMI connectors. On this a base attaches allowing the entire ensemble to free-stand if sitting it on a cabinet. Wall-mounting is also an option. Speaking of connectors, LG hasn’t skimped. There are four HDMI ports (three on the side and one on the rear of the C8’s base). They’ve also added in USB ports, an ethernet port, optical digital output, line out and headphone jack. There’s also built-in WiFi/Bluetooth support. Anyone who has used Nintendo’s Wii will love the Magic remote, which is similar to the Wii’s motion controller. On-screen pointer movement corresponds to where you point the remote. Add to this a scroll wheel, and accessing on-screen menus and driving the C8 is close to being bulletproof. Any smart TV is only ever going to be as good as the usability and support of its OS. LG’s platform of choice is WebOS and this is mostly unchanged from previous versions. It is a doddle to drive, responsive and there are some good third party apps available – my favourite was the NASA ISS HD feed, closely followed by the virtual UHD fireplace. Nearly all streaming services are supported, with only a few omissions – Neon, for example. The Gallery function displays artwork when there is no input signal, complete with a surprisingly convincing faux picture frame. 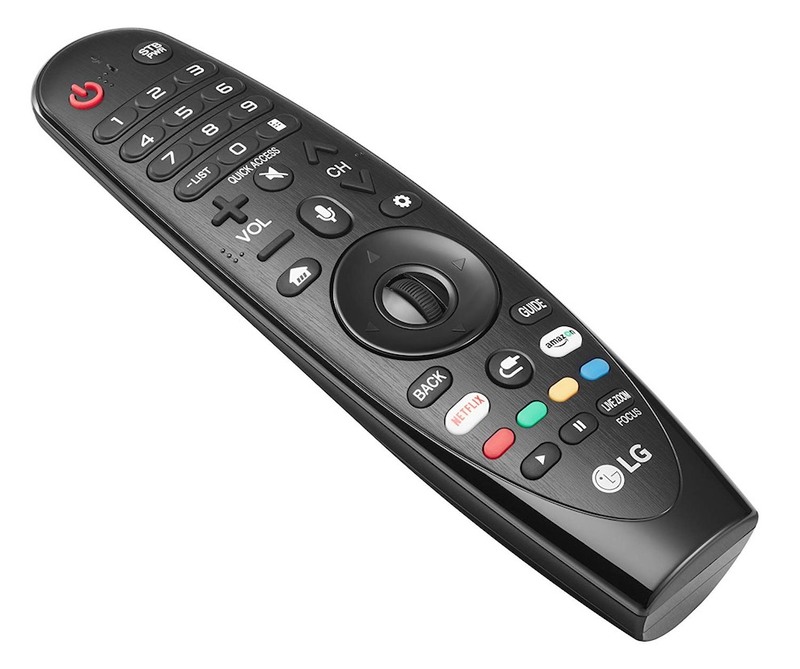 The magic remote also makes the built-in web browser a practical proposition. There’s also voice control, making use of a mic built into the Magic remote. While this might not sound like anything particularly earth-shattering, LG has added a twist. It uses natural language processing, so conversational commands such as muttering “turn the volume down” do work. In use, it is about as easy to drive as using Alexa or the Google assistant. LG have branded it ThinQ AI. Because it uses open-standard protocols, the C8 can communicate with other compatible smart home widgets including Google Home and Amazon Echo. In essence, your voice becomes your remote. In use, the C8 makes last year’s OLED TVs look dull, delivering some of the most impressive UHD/HD images I’ve seen from a TV. Being an OLED beast, on-screen blacks were dark while on-screen whites dazzled. That said, shadow detail on HDR encoded content was easily discernible too. Colours were well saturated, yet natural looking. This was particularly evident with skin tones which avoided sun-burnt pink or Simpsons yellow. This is thanks to LG’s new Alpha 9 video processor. It can take ho-hum HD footage and upscale it to the C8’s native UHD resolution, cleaning up video artefacts in the process. High-quality native Blu-ray content looked great, and UHD YouTube footage was stunning. Even older lower-quality footage from streaming services still looked good. Edge artefacts, colour banding and other annoyances were rendered next to unnoticeable, the dreaded soap opera effect nowhere to be seen. The C8’s motion handling also impressed. Sports fans will be pleased to note that Ruby looked great. Tracking shots were smooth and judder-free. This is due to Motion Pro mode. It adds a black frame between alternating video frames. This delivers smooth motion without the awfulness of the soap opera effect. I did notice that when it was enabled, its video was a little dark, but all told it was impressive. On the audio front, LG managed to cram a Dolby Atmos effect and 40W of amplification into the C8’s wafer-thin chassis. While a decent home theatre system with good 5.1/7.1 speakers will always sound better, the sound delivered by the C8 was good. Audio is an unspoken downside of ultra-thin TVs. Speakers pump air. The bigger they are, the more air they can move, which helps deliver a more natural sound. Skinny TVs don’t have room for decent sized speakers. Because of this, most struggle to reproduce anything approaching decent audio. Getting around this involved some particularly smart engineering to the C8’s base stand. It not only beams a convincing left-right audio field but can also deliver an up/down height sound field. It produced decent mids and highs, but a sub is really needed for anything approximating bass. Dolby Atmos support works by the C8 applying clever psycho-acoustic trickery. It does work up to a point. That said, anyone who can afford the C8 is likely to have a decent home theatre amp and speakers anyhow. The C8 takes what was already good with LG’s previous models and builds on what they did well. The net result is a TV that delivers stunning HD/UHD on-screen images, with great contrast thanks to deep blacks and vibrant colours helping things along nicely. WebOS is a winner with decent app support too. All this is not too shabby for less than $4000.